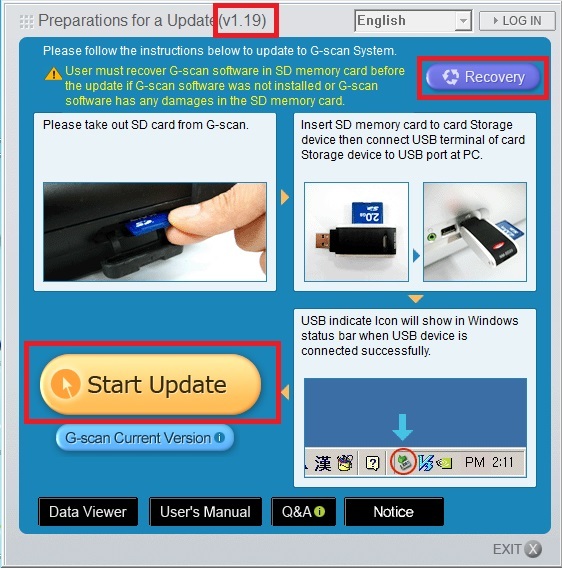 You can recover and update SD card for G-scan by PC Utility. When you update SD card by PC utility via internet, do not connect proxy network. 1. Insert you SD card into PC and perform Window format of SD card. Perform recovery for SD card via PC Utility(E-H-1000, V1.19). If you dont't have PC Utiliy, E-H-1000, download the attachment file(PC_Utility_HME.zip). After recovery, insert your SD card into your G-scan and turn it on. After you confirm that the G-scan is on, please turn it off. Insert your SD card into your PC and perform the Internet update via PC Utility(E-H-1000). What is SD card specification for G-scan? I was getting the message "The product is not licensed[ ]"